Gathered in Almaty, Kazakhstan, from 28 to 29 October, the UNESCO international jury of experts in handicraft has completed the evaluation of the 2010 submissions received from artisans from Kazakhstan, Kyrgyzstan, Tajikistan, Turkmenistan and Uzbekistan participating in the UNESCO flagship programme ‘Award of Excellence for Handicraft Products’. Few days earlier, from 23 to 25 October in Isfahan, the international jury examined handicraft products from Iran. Established to encourage craft-workers to use traditional skills and materials, the Award of Excellence programme (referred to as the Award) aims to ensure the continuation of traditional knowledge and skills and the preservation of cultural diversity in the region. By recognizing excellence in craftsmanship, the programme aims to set quality standards, raise international awareness and strengthen market demand for West-Central Asian handicraft products. The Award programme was initiated in 2001 by the UNESCO Asia-Pacific Regional Office in Bangkok and the ASEAN Handicraft Promotion and Development Association (AHPADA). In 2004 the programme was expanded to Central Asia (Kazakhstan, Kyrgyzstan, Tajikistan, Turkmenistan and Uzbekistan) and South Asia (Bangladesh, Bhutan, India, Maldives, Nepal, Pakistan and Sri Lanka). In 2006 the UNESCO Beijing office successfully launched the Award programme in East Asia (China, Democratic People's Republic of Korea, Japan, Mongolia and Republic of Korea). UNESCO's partner for the Award programme in Central Asia since 2004 is the Central Asian Crafts Support Association (CACSA). In 2007 Iran joined the Award programme in Central Asia. The panel of judges and experts in design, marketing and handicraft production met in October in Isfahan, Iran and then in Almaty, Kazakhstan to review the submissions of crafts ranging from jewelry and toys to household decorations and garments. Each craft item was reviewed according to four key criteria including excellence, authenticity, innovation and marketability. 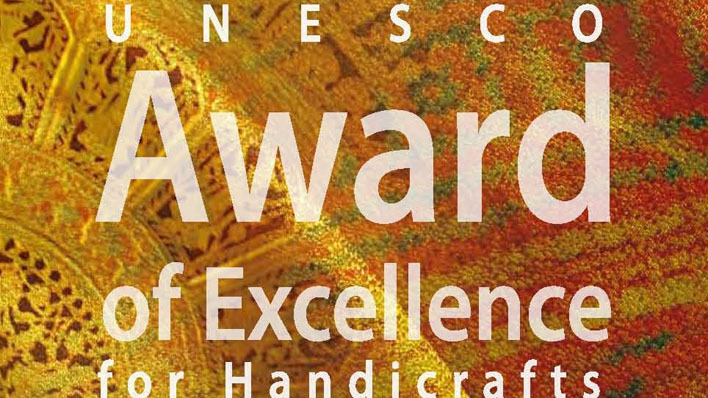 The UNESCO Award of Excellence was awarded to 92 handicraft products out of 357 entries: 65 from Iran, 8 from Kyrgyzstan, 13 from Kazakhstan, 2 from Tajikistan, 1 from Turkmenistan and 3 from Uzbekistan. Ms Roza Zhusupova, President of CACSA, says that "the results of judging showed that it is necessary to continue work on improving the quality of handicraft products and increasing the awareness of artisans in the field of marketing and pricing." The regular implementation of the UNESCO Award of Excellence for Handicraft Products in West-Central Asia is an important contribution to the promotion of traditional Central Asian craftsmanship in the world crafts market, to the mutual enrichment of West-Central Asian traditional cultures, a better understanding of other cultures and development of intercultural dialogue for peace and security in the region as well as globally. The Award ceremony and Press-conference are scheduled for 3rd December 2010 in Almaty, Kazakhstan during the Annual Central Asian Crafts Fair.